Christmas Home Tour Tickets go on sale soon! Tickets for the Christmas Home Tour will go on sale soon. We are excited to again be doing this event and know that many of you band together and come with your sisters, mothers, friends, and family. 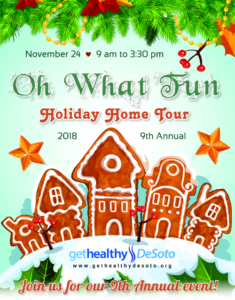 This year’s theme is Oh What Fun!, and we hope that you will truly enjoy the festive atmosphere of the homes. Many of the homes have young children, and we hope you can see the beauty of Christmas through the eyes of the families on our tour, regardless of the size of the family. Tickets will again be $15 each prior to the tour and then go up to $18 the day of the tour. We’ll keep you posted about where you can purchase tickets and hope to see you soon!